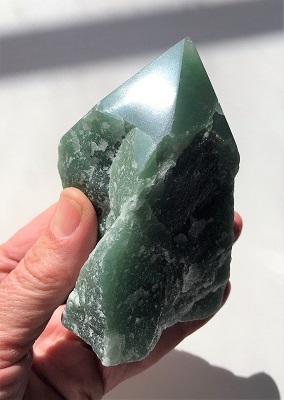 Beautiful sage green Aventurine with sparkly quartz surface Crystal Point from Brazil. 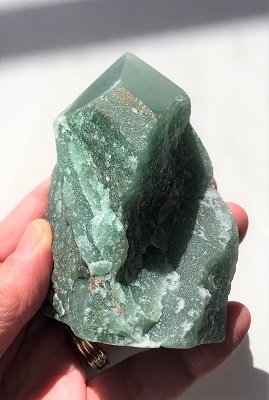 Beautiful sage green Aventurine with sparkly quartz surface Crystal Point from Brazil. 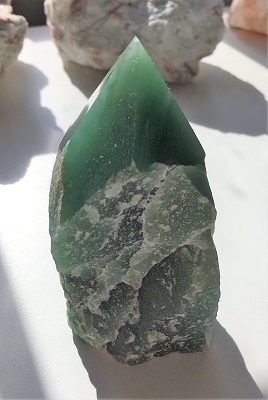 This green aventurine crystal point provides focus for energy that is a comforting, heart healing, and harmonizing while protecting the heart. Green Aventurine creates an optimistic attitude and gives one a zest for living. Green Aventurine helps one move forward with confidence when facing changes and new situations. Traditionally used as a gambler's talisman, a stone of "good luck," Green Aventurine helps manifest greater prosperity. Green Aventurine assists in establishing exactly what makes you happy or unhappy. Green Aventurine soothes emotional wounds and helps one to release unhealthy relationships and outdated behavioral patterns. 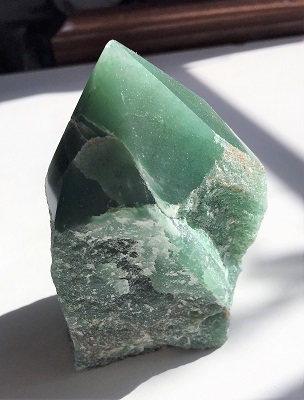 Encouraging a positive attitude, Green Aventurine helps one to release attachment to experiences and to view challenging circumstances as an opportunity for growth. Green Aventurine reinvigorates one's life force and aids in rebuilding depleted energy sources. Green Aventurine settles nausea, dissolves negative emotions/thoughts; is an all-round healer, bringing well-being and emotional calm. In healing, Green Aventurine is said to benefit the thymus gland, connective tissues and nervous system; balancing blood pressure and stimulating the metabolism, lowering cholesterol to help prevent arteriosclerosis and heart attack.